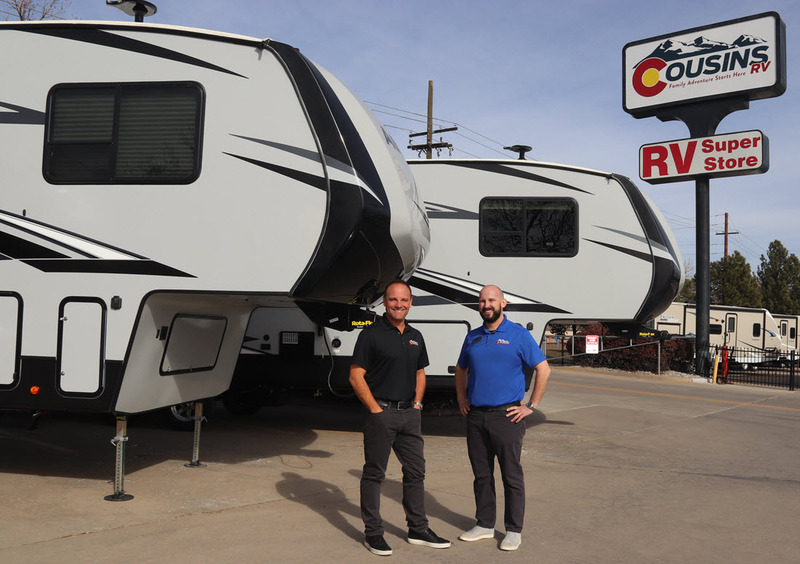 Cousins Jim Humble and Drew Bryant are now the proud owners of Cousins RV (previously RV Four Seasons) with locations in Loveland and Wheat Ridge, Colorado. Cousins Jim and Drew, whose parents are brother and sister, grew up in different parts of the country and the RV business brought them together in 2000. Jim has been in the RV industry for over 27 years -- the majority of his life! He began his career in RV parts and pumping propane, then moved to RV service, sales, and finally management. After several years, Jim came to operate two separate, and very successful, RV dealerships in the Denver area. He also served on the boards of several important RV industry organizations, including president of the RV Dealers Association of Colorado. His dream has always been to own and operate an RV dealership. The cousins started working together in 2000, and like Jim, Drew worked his way through all areas of the RV business, including management. Drew also hoped to one day own and operate an RV dealership. Together for almost 20 years, they have well over 40 years of combined RV industry experience making dreams coming true for thousands of very happy customers. Now with their dream of owning an RV dealership fulfilled, their first priority is to continue to provide excellent customer service in a family-friendly environment. To them, the customer is priority #1 in both the sales and service areas of their business. At Cousins RV, you will find a great selection of Motorhomes, Travel Trailers, Fifth Wheels, Toy Haulers and Ultra Lite Campers — all from popular brands like Thor, Keystone, Palomino, Coachmen, Prime Time, Starcraft, Forest River, and Venture. Along with an excellent service staff providing on-site RV Service and mobile RV service, Cousins RV also offers a full body shop and paint booth. Come See For Yourself What Makes Us Colorado's #1 Choice for Everthing RV.